It’s been a while since I’ve written a review. Had some major life changes including a promotion, taking on some freelance work, and a move, so excuse my absence. I’m still settling into all my new roles and I haven’t been able to read as much as I’ve wanted during this time. However, I’m getting back into the groove, especially since I can basically listen to audiobooks as much as I want at my new job without much interruption. I’m still having a harder time sitting down to read an actual dead tree book or an eBook, though. I’ll probably be writing more review bites for the foreseeable future until everything smooths out. The game Mass Effect: Andromeda was a disappointing play for many—including me. That’s hard for me to say since I love the Mass Effect series and have spent hundreds of hours playing the original trilogy. Despite that, this game did have so much potential with the various angles they introduced into the story, but the execution left much to be desired. In Mass Effect: Andromeda, players wake from a 600 year sleep that saw them travel from the Milky Way to the Andromeda galaxy. The purpose of this mission is to find new homes for the Milky Way species to circumvent the unavoidable resource crisis that would eventually hit the Milky Way and to have enough time to create advanced technology to help facilitate trade between the two galaxies. However, dealing with the unknown can bring about unique problems. While the players’ character sleeps, a team meant to wake ahead of and prepare for the arrival of the others finds themselves dealing with a resource crisis of their own as everything that could go wrong seems to do just that, leaving the characters in this book to try to create solutions to problems that have given them very few outs. Tensions between the crew and leadership continues to mount as well-meaning intentions to correct their situation continues to compound their problems. This book introduces some key players from the game, giving depth to their individual stories and showing how they managed to fill the roles they’re currently occupying when players meet them in the game. 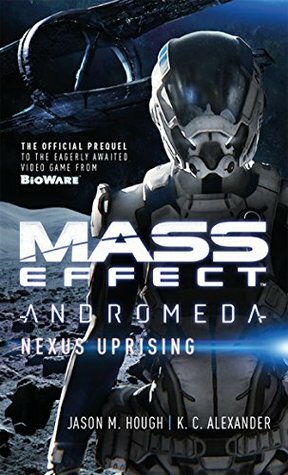 I appreciated this book for what it tries to do, but after playing Mass Effect: Andromeda. I think it was hard for me to fully appreciate this book as much as I wanted to, and I think that’s because I read this so soon after playing the game. However, I did really enjoy the narration for this book, and after some consideration, I did up my rating on this a little. Sometimes it can be hard for me to appreciate the narration for books like these if I already have a set voice in my mind thanks to a books accompanying game (or movie/television show), but Fryda Wolff was an excellent narrator for this book. Despite my mixed feelings about this book, I am looking forward to the upcoming books based in the Andromeda universe. In preparation for reading Who Fears Death, I decided to read this prequel book first rather than diving into the main story and then coming back to this. 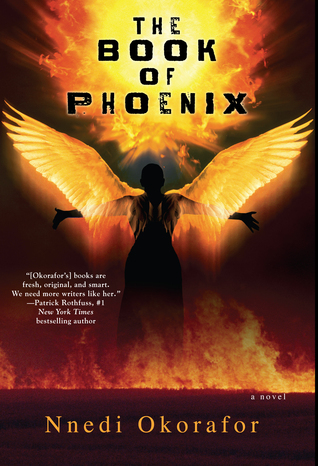 The Book of Phoenix follows Phoenix, a woman genetically created for a purpose that is unknown to her (at first). Phoenix has the mind and the body of an adult woman in her 40s, but she was only born two years prior to this story. Phoenix lives in Tower 7 along with other genetically enhanced men and women where she spends her days learning and indulging in a forbidden love with another Tower 7 resident named Saaed. After Saaed’s suicide, Phoenix begins to question the world and her existence. This leads her on a journey that profoundly changes her and humanity. From the opening of this book, I found myself completely enthralled by this story. I loved it’s blend of mythology, fantasy, and science fiction. While I loved the characters, their stories, and what they hoped to achieve, Phoenix was my favorite thing about this story. Following her story, the story of someone who is both mature and childlike in thinking, was fascinating. Watching Phoenix grow, reason, and learn about the incongruous nature of the world and people touches many emotional points. As I was listening, I felt sorrow, joy, and a whole mess of other emotions as Phoenix lived and learned. This is a beautiful story that left me thinking about it for days after. I still haven’t started reading the main book yet because I still have many feelings about this book. Robin Miles never fails to disappoint in her narrations. She brings each character to life, and she made some scenes feel like they were much more exciting and interesting because of her reading than they would’ve been if I had just read the book myself. I can never stress enough just how amazing Ms. Miles is as a narrator. She’s one of those narrators who can really make listening to a book a powerful experience. If you’re a reader who is invested in reading more diverse stories or if you enjoy seeing writers blend African mythology with science fiction, then I highly recommend giving this book a chance. I’ve heard so much about Mass Effect (having never played it) that I admit to being curious whenever I see a book about the game show up. Sorry to hear Andromeda was disappointing. Glad it still mostly worked though.